Waterfalls and fountains are the easiest way to instantly create a spa resort pool in your backyard. Fountains can easily be added around the pool or patio area, and if you have a bit more in your budget, definitely consider adding a waterfall to add that extra “glam” and natural beauty to your spa area. Tiki torches are an inexpensive way to add some tropical charm to your backyard oasis (and they’ll help keep the bugs at bay, too!). A fire pit can also easily and inexpensively be added to your backyard space, and is always a favorite amongst guests. If you have a bit more to spend, look into adding fire bowls to your pool area, or consider adding fire features to your existing water features for a truly unique experience. Most spa areas in resorts are quite naturalistic and feature a number of “natural” pieces, such as large rocks, grottos, and natural stone decks and patio surfaces. Many of these features can be incorporated along with waterfalls and fountains that you may choose to add to your space. 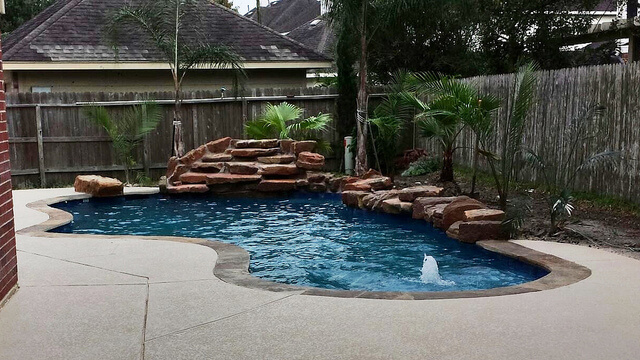 One of the most highly sought after features in pools today is a wading area. Far shallower than the standard 3 to 4 feet, these areas are incredibly versatile. They can be used as a tanning ledge, as a play area for young children, or as a splash pad for your pets. After you’ve installed some of the above features in your pool, then you may want to look at adding some larger and more “drastic” features, such as stairways and bridges. These features are especially ideal if you plan on incorporating multiple levels in your pool.